by Andy Higgs in Asia, Features, Home, Places, Thailand. If you’ve been following my updates on Facebook, Twitter and Instagram you’ll know that I have recently returned from an extended stay in Bangkok where I took part in the Digital Innovation Asia (DIA) conference. 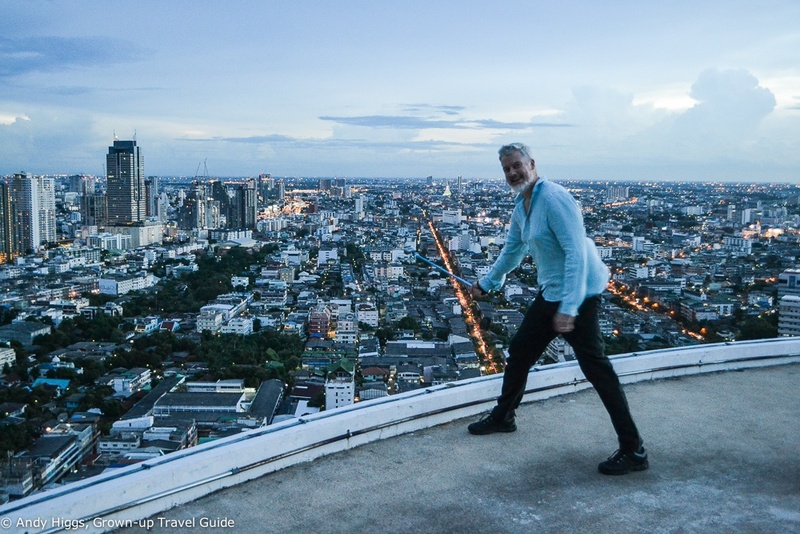 You will also be aware that I enjoyed myself immensely and found the city to be peaceful and safe – indeed it felt a lot more relaxed than when I was there in December when we stumbled into a demonstration in downtown Bangkok. It wasn’t threatening but there was a very tense atmosphere. Planned months in advance, the timing of the conference turned out to be unfortunate, to put it mildly. Since the inaugural DIA last year – which I also attended – Bangkok had been the stage on which the long-running and seemingly insolvable division between two halves of the country was played out. Briefly, months of protests and clashes in which at least 28 people are alleged to have died and day-to-day life in the Thai capital was in a state of turmoil led to the imposition of a state of emergency in January. An election was held in early February but the opposition stayed away and political deadlock was the only real result. Events reached a head at the beginning of May; the Thai Constitutional Court ordered Prime Minister Yingluck Shinawatra and several cabinet ministers to step down, which left a power vacuum and confusion as to where the country was headed. Since the main opposition group refused to recognise the result of the election and continued to push for the overthrow of Thailand’s democratically-elected government, a stalemate had once again been reached. As it has done so many times in the past, the Thai army made its move on May 20 by declaring martial law and two days later took power in a fully-fledged military coup. 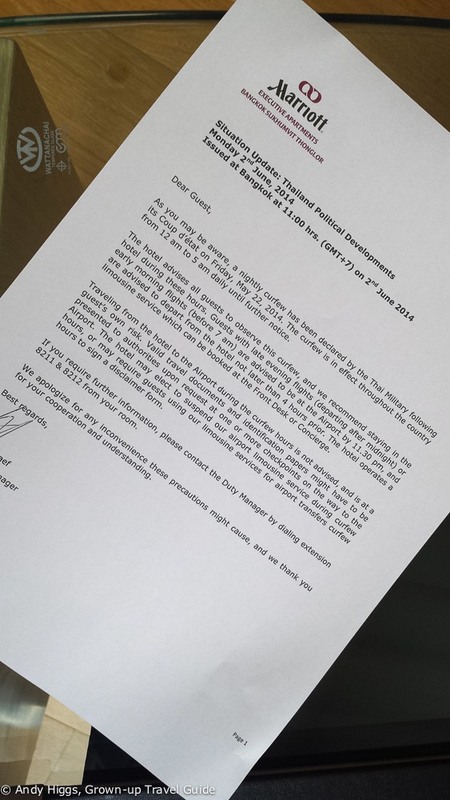 With the DIA conference scheduled for June 2, this threw a large, khaki-coloured spanner in the works. Along with the majority of the participants, I had paid for my own flights to Bangkok as well as several extra nights in the city in addition to the time we would be hosted during the event. I had to consider whether to drop the trip to Thailand or keep calm and carry on regardless. On its part, the DIA team had to decide whether to cancel the entire conference or try to salvage what it could and go ahead. I’ll be honest, cancelling never even crossed my mind. 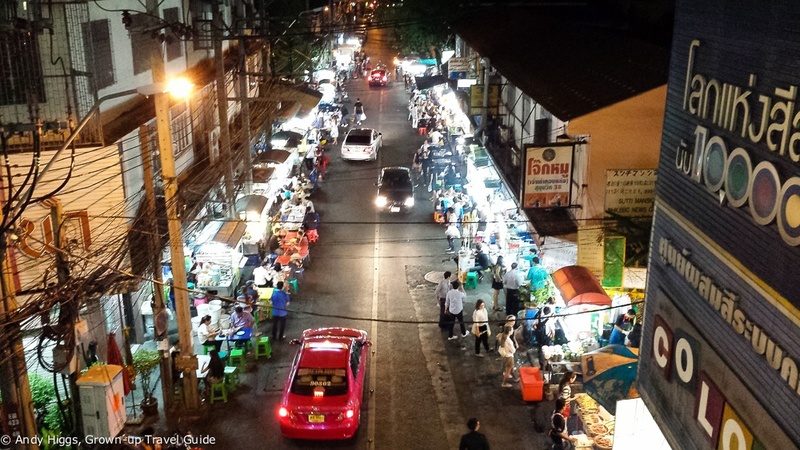 After following the situation closely on the BBC and Bangkok Post websites I was convinced that I would actually be safer in the city than on my last visit. 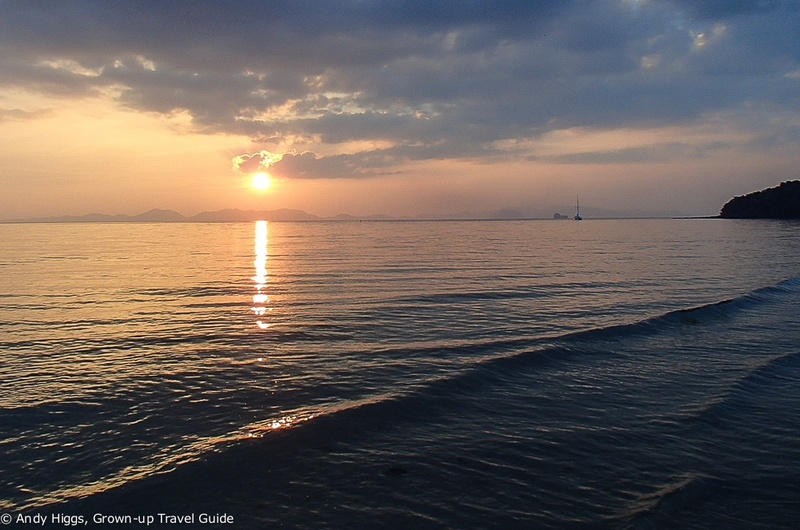 Moreover I had the mother of all dream trips lined up – due to a shrewd redemption of cheap US Airways miles I had secured my final big blow-out before the airline left Star Alliance. 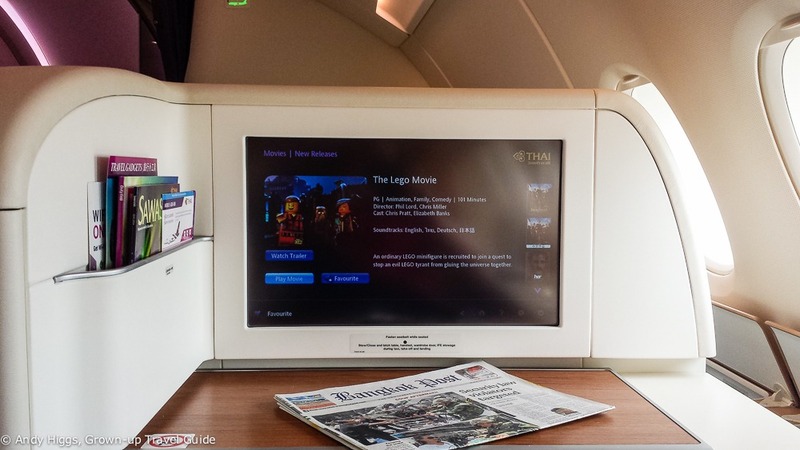 First Class tickets with The Lego Movie as entertainment – you think I’m cancelling this? After consulting with those involved in the conference as well as the Thai tourism authorities, it was decided that the event would go ahead on a much smaller scale. 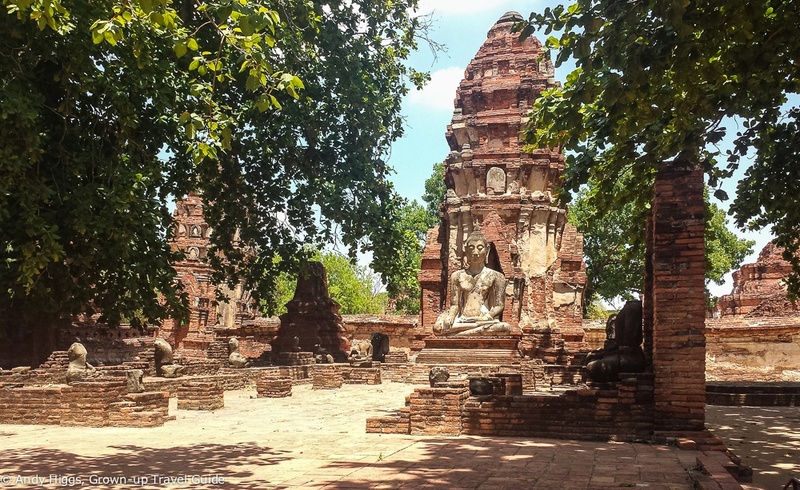 It would now consist of a two-day bloggers trip to Ayutthaya, a full day of meetings and ‘speed dating’ between bloggers and the travel trade participants and a number of evening functions including dinners and tours of the city with a local company. Just to make it clear – this was a privately-led initiative backed by the Thailand tourist authority but not arranged by them. We were not being flown in and paid to provide positive copy about the country, we were investing our own time and money to take part, make business contacts and to visit Bangkok under difficult circumstances when the majority of the world’s press was telling us how dangerous it was to be there. This is about my view on the situation. I repeat, MY view – as a tourist. I am not a political journalist or expert on Thailand. 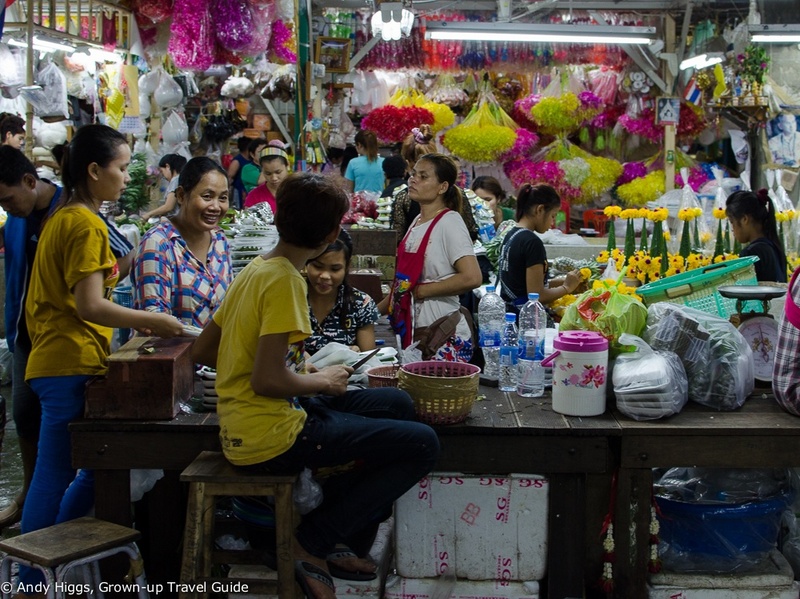 I’m a tourist and a relative newbie at that – my first time was in June last year when I spent 8 days in Bangkok. 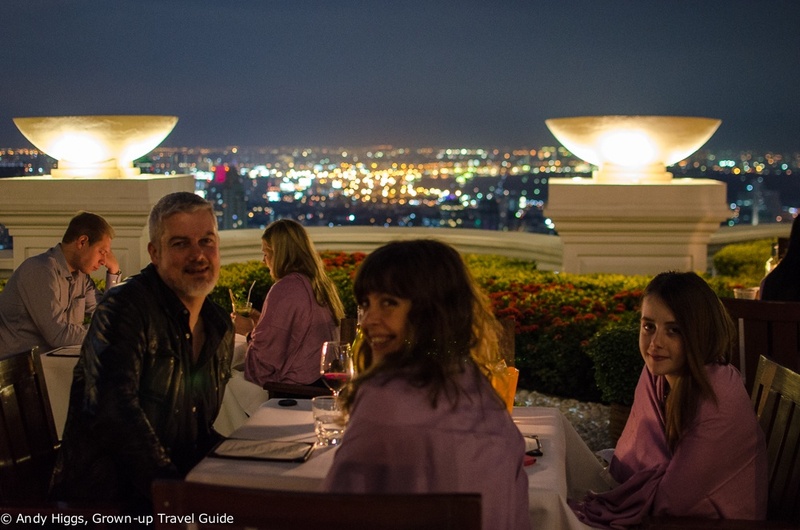 In December 2013 I returned to Thailand with my wife and daughter and we spent four days in the capital before flying down to Krabi for Christmas and New Year’s Eve. 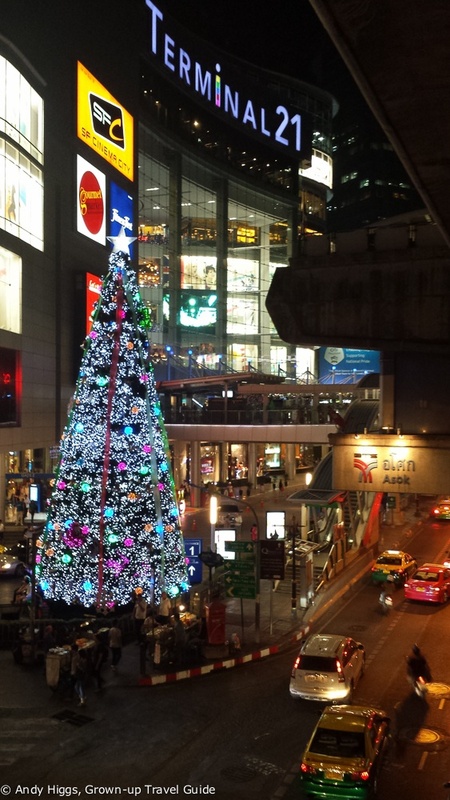 We then stopped off in Bangkok again for another night before returning to Norway. I don’t have years of travel to Thailand to draw upon but I have been there recently, both before and after the coup. I think this puts me in a good position to share my insights and experiences and help you decide whether you should visit the ‘land of smiles’ for a holiday. I want to emphasise that I am not passing judgement on the politics of the country – but even if I was, it would be my personal opinion and mine alone. In the end the choice to visit is yours alone – but I hope this article helps you to consider the whole picture and not just the one portrayed in the often rather hysterical international media coverage. I appreciate that the reference there to a relatively obscure TV series from 1988 (A Very British Coup, fact fans) was probably lost to many readers but the point should still be clear – a coup in Thailand is different from a coup in may other countries. The sad fact is that Thailand is used to coups – this is the 12th time the military has taken power since the end of absolute monarchy in 1932. By and large, its people react as they would to any other changeover of government – many are opposed to the new leadership but in general it is accepted over time, especially if given royal approval. Tourism plays such a vital part in the country that nobody – regardless of politics – wants to scare off visitors. The protests, martial law and coup have had a huge effect on arrival numbers; a serious decline began last year. A lot of the damage has thus already been done, making those travellers who still arrive in Bangkok even more precious to the country as a whole. When I was in the capital it was effectively shut down in the small hours but this is no longer the case so (night)life has also returned to normal. Day-to-day business has also resumed at last free of the disruption and losses caused by protests and demonstrations blocking access and forcing shops and stalls to close. Make no mistake, choosing not to visit Thailand is a completely ineffective form of political protest. 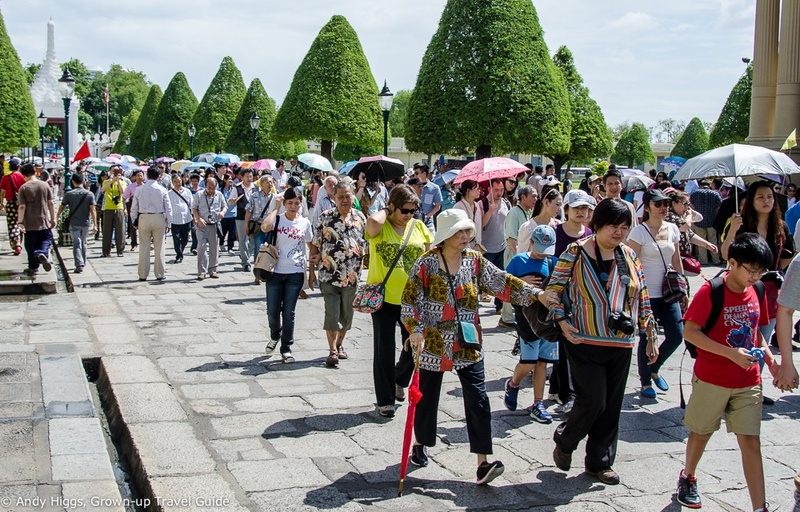 Staying away and spending your holiday money elsewhere won’t directly hurt the military regime, but it will hurt the Thais who benefit from tourism earnings. 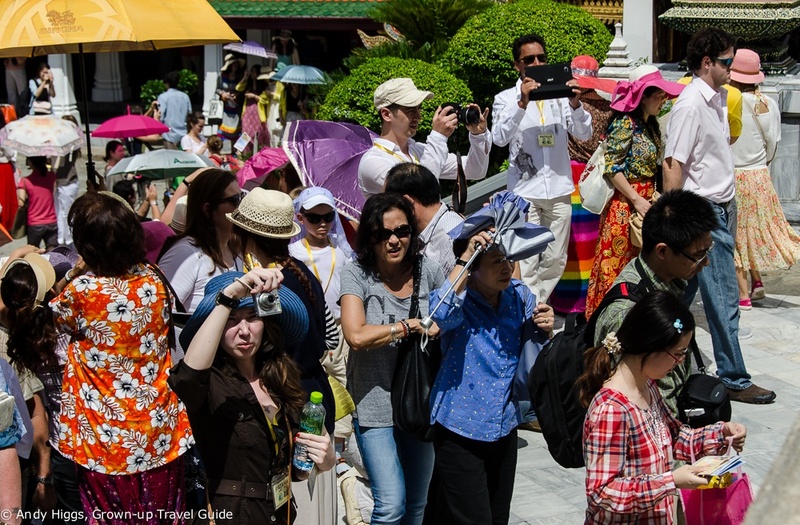 Considering that tourism is estimated to account for nearly 10% of Thailand’s GDP, that’s a lot of Thais. I don’t expect either situation to last long but it is a fact that right now you can enjoy the sights without quite as many people as usual and it’s a buyer’s market for hotel rooms. Even at regular prices, you can enjoy a class of hotel in Thailand that would likely be well out of your reach in Europe or elsewhere. Standards are extraordinarily high and competition is fierce, with hotels vying to outdo one another. It’s no coincidence my first experiences with a ‘turn-down service’, having a butler assigned to my room and my airport transfer being a shiny new Jaguar all took place in Thailand. 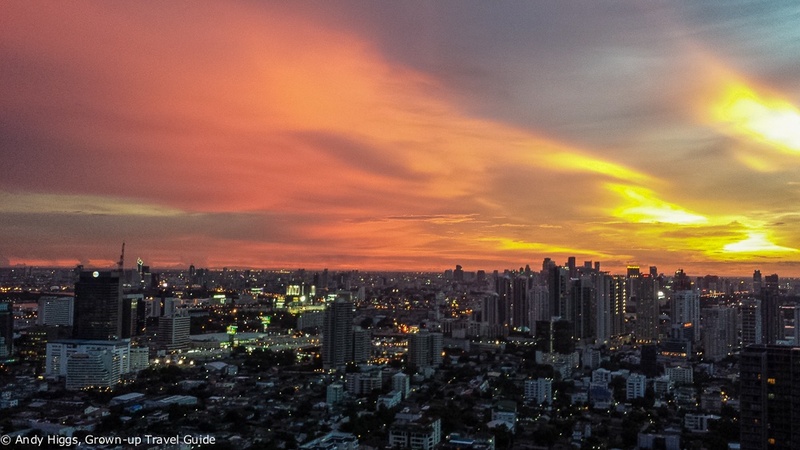 If you do travel now, be warned that it is insanely hot and humid in June in Bangkok as my two experiences testify – but if you can lock in those prices for a trip in the future, don’t hesitate. If your home country has issued a warning against travel to Thailand then make sure you are still covered. This is an issue I had not been aware of and the biggest problem for tourism after the coup – several countries issued travel advisories and some even put Thailand in the same group as Syria and Afghanistan – making travel insurance providers understandably reconsider coverage. Never travel without valid insurance coverage no matter where you are headed and make sure the policy is right for you. If you are an older Grown-up Traveller you may need to take extra care when choosing travel insurance for the 0ver 60s. Sadly, by definition the phrase ‘military coup’ seemingly triggers warnings according to a checklist ticked off by diplomatic staff intent on avoiding all possible liability for injury to their citizens. This is a laudable aim but often does not reflect the actual reality of safety in a country and is more of a political reaction. It causes huge damage, in some cases unnecessarily, and such warnings do not appear to be reviewed on a regular basis once in place. 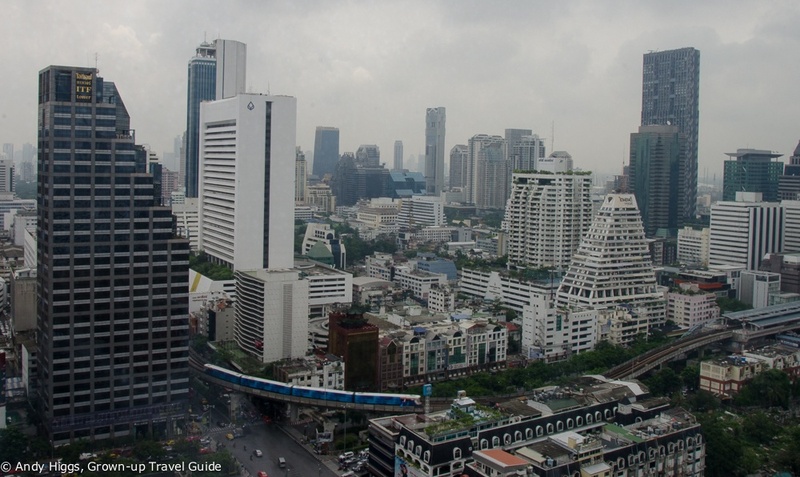 In Thailand the hotel operators we spoke to were suffering most due to cancellations by corporate clients – companies could not insure their staff for their business trips to Bangkok so they had to pull out of large-scale meetings and events. The people are friendlier than ever. The Grand Palace hasn’t disappeared. The rooftop bars will still blow your mind. The street food is still the best in the world. The beaches are still beautiful. To sum up, from my experience Thailand is safe for travel as a tourist despite the less-than-perfect political situation. If you want to experience the delights of the country and have been hesitant after the coup, I’d urge you to visit. I can’t guarantee everything will be fine, but then I can’t guarantee that about any destination. I’m assuming you are enough of a Grown-up Traveller to make your own informed decision and if you have any questions or comments I’d be happy to answer them as best I can. Thanks for commenting Alana. Yes, I think it’s important to consider this carefully as part of any decision – there are better ways to score political points. Hey Andy, this is a nice post and thanks for clearing the doubts about Thailand. I am packing my bags for Thailand. As you know, I was also at the DIA conference and I was struck the whole time by how the situation on the ground seemed so different to the images being portrayed in the international media. The politics aside, Thailand is as safe as ever for a tourist. I think you’ve described that really well and I’m sure your other readers will have a clearer picture now because of what you’ve written. Just like you say, the main point is that for visitors, it’s as safe as before the coup.